This species is accepted, and its native range is W. & S. Europe to N. Iran, NW. Africa. Cultivada en Colombia; Alt. 2600 m.; Andes. Robson, N.K.B. (2012). Studies in the genus Hypericum L. (Hypericaceae) 9. Addenda, corrigenda, keys, lists and general discussion Phytotaxa 72: 1-111. Robson, N.K.B. (1985). 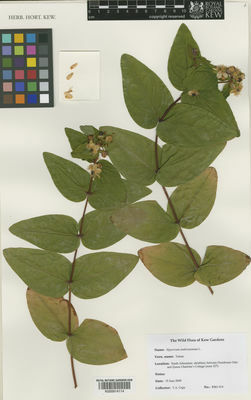 Studies in the genus Hypericum L. (Guttiferae). 3. Sections 1. Campylosporus to 6a. Umbraculoides Bulletin of the British Museum (Natural History). Botany 12: 163-325.